Despite his certain execution, Paul knows that he has been faithful to his calling from God. Paul describes himself as already “being poured out like a drink offering.” This is a particularly vivid image that anyone in the ancient world would understand. The verb is a single word (σπένδω) usually translated as the phrase “poured out like a drink offering.” This refers to pouring wine (or water) onto the altar as the main sacrifice was being burned. In Num 15:24, for example, a sacrifice is a “pleasing aroma to the Lord” and is accompanied by an offering of wine and grain as well. A drink offering is never the main sacrifice, it is one that is given along with the main sacrifice. Paul used this same word in Phil 2:17 in a similar context, he refers to his life as a kind of sacrifice that accompanies the “main sacrifice.” In Philippians 2:17, the main sacrifice is the faith of the Philippian church. Here in 2 Tim 4:6 Paul does not specify the main offering. Perhaps he is thinking of Jesus as the main sacrifice for sin, and the martyrdom of the believer as that which accompanies the main sacrifice. The second metaphor is also sports-related. Paul has “finished the race.” Looking ahead at the end of this section, Paul knows that he has competed well and will have his reward when he stands before the judge. 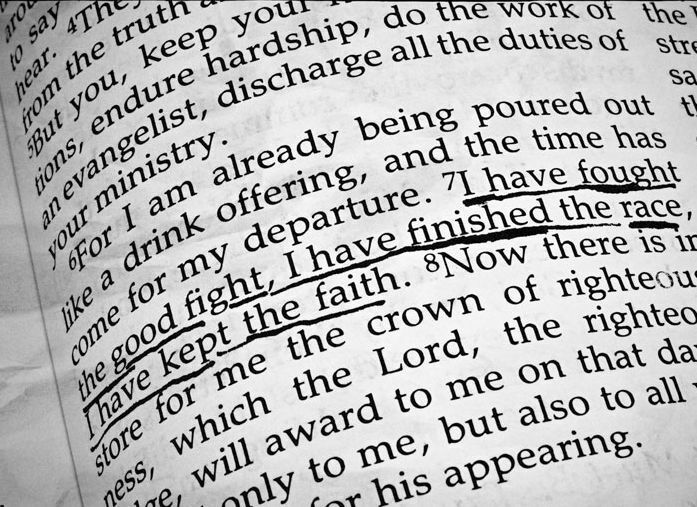 Third, looking back on his ministry, Paul can say that he has “kept the faith.” This ought to understood of what the “faith” means in 2 Timothy. He has not qualified or compromised his doctrine in the face of persecution. Paul was prepared to preach his gospel whenever and wherever he was called, he was ultimately committed to “discharge the duties of a minister of the gospel.” Even in his death, Paul is setting himself up for Timothy as an example. Being faithful to the Gospel is dangerous and may very well put Timothy in same sort of imprisonment Paul is facing at this moment. In fact, Paul has already been “rescued from the lion’s mouth,” despite no one coming to his defense (vv. 16-17). The “earlier defense” could refer to the end of the book of Acts, Paul’s first imprisonment in Rome. But Paul seems to be referring to more recent events, so it is likely that he has in mind a preliminary trial after his second arrest in Rome, perhaps just after the Fire of Rome. The reference to being saved from the “mouth of the lions” could be literal, but if it is it means that he was not thrown to the lions when he might have been. It is not the case that he was in the arena about to be killed and somehow he was rescued. Think of this as someone who is acquitted from a capital offense “escaping the hangman’s noose.” The important fact is that God rescued him despite the fact that no human came to his defense. Paul will receive a “crown of righteousness.” This is the natural metaphor that follows from the use of a race or a boxing match a few lines before. But is this righteousness a description of the crown, or is righteousness itself the reward? Typically we focus on justification as righteousness given to the believer in Christ at the moment of salvation, in other texts Paul looks at our ultimate justification (being made righteous) at the resurrection (Gal 5:5). Paul’s final words to Timothy and to us focus on the Gospel – we ought to continue in our calling to stand on the foundation of Scripture and clearly proclaim the gospel. This is the “good fight” to which we have all been called. The wine offering was poured out on the side of the altar not on the burning sacrifices. There were gutters that carried the poured out offering away for the sake of tidiness. The wine would have compromised the burning wood in the altar or may have caused an unsafe condition by the side of the altar if it wasn’t channeled away. The Tabernacle with its ground floor wasn’t equipped as such since the soil would soak up the wine for the most part. Good word. I hadn’t considered the drink offering as “secondary” before.